From 1889, the East & Midland Railway (E&MR) usually only worked its own trains east of Lynn, letting the Midland Railway and the Great Northern (GNR) Railway to operate services west of Lynn. The Midland & Great Northern Joint Railway (M&GN) was formed in 1893. Jointly managed by the Midland and GNR, the M&GN took control of both the E&MR's locomotive stock and complete rail network. The E&MR had sufficient locomotives to only operate the eastern section, so the M&GN found it needed new locomotives to operate the entire network. This was solved with the delivery of the M&GN Class C locomotives, designed by S.W. Johnson of the Midland. These were inside-cylinder 4-4-0s that were almost identical to the Midland's existing "1808" Class. The most significant changes were the slightly deeper frames, and the slightly larger (by 0.5in) diameter cylinders. An initial batch of twenty six engines were built in 1894 by Sharp, Stewart & Co. These were followed by seven more Sharp, Stewart engines in 1896, and seven Beyer, Peacock & Co. engines in 1899. It is unusual that such a small railway purchased forty locomotives of the same design within a space of only five years. In fact, the M&GN never built any more passenger locomotives, and the Class C engines took the bulk of the M&GN's passenger traffic until 1937. They would be the last of S.W. Johnson's 4-4-0s to remain in service in essentially original condition. 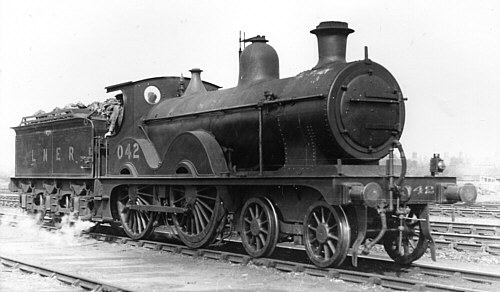 The original boilers were of the Midland Class B type. The Class B boilers had many variations, but the original Class C locomotives were built with the 244 1.625in tube variant. The Midland supplied a number of different variants as spares, but records suggest that all of the un-rebuilt Class C engines were fitted with the 196 1.75in tube variant when they entered LNER ownership in 1936. This boiler was interchangeable with the boiler fitted to the J40 0-6-0 locomotives. The LNER initially classified the un-rebuilt engines as Class C/1, but reclassified them as D52 in July 1942. Eventually all of these engines received extended smokeboxes and Melton Constable chimneys. Two of the Class C locomotives followed contemporary Midland Railway practice and were rebuilt with S.W. Johnson Class H large diameter round-topped boilers in 1908. Between 1909 and 1916, eight were rebuilt with the Midland "G7" boiler. The G7 boiler was actually the Belpaire version of the Deeley Class H boiler. The two 1908 rebuilds were similarly rebuilt in 1924-5. 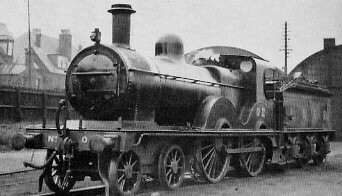 The Class C locomotives kept their original Midland frames during these rebuilds - unlike similar rebuilds on the Midland Railway which received deeper frames. The rebuilds also retained their Ramsbottom safety valves. The M&GN gave the large Belpaire boiler rebuilds the classification of "Class C Rebuild". On taking control in October 1936, the LNER initially classed these engines as Class C/3, but then reclassified them as D54 in July 1942. Seven of the original locomotives were rebuilt with Fowler small Belpaire boilers in 1929-31. Given the Midland designation of "G6", these boilers had a similar tube arrangement as the Class B boilers, but they were fabricated from two rings instead of three. Unlike the large Belpaire rebuilds, these locomotives continued to be classed as simply "Class C". On taking control in October 1936, the LNER initially classed these engines as Class C/2, but then reclassified them as D53 in July 1942. Unlike the large Belpaire (D54) locomotives, the small Belpaire rebuilds included Ross pop safety valves instead of Ramsbottom safety valves. The Ross pop valves were reported to frighten nearby horses when they suddenly blew-off, so the Ramsbottom valves were re-fitted before 1937. Possibly due to a boiler swap, at least one D53 was withdrawn with Ross valves re-fitted. The M&GN's territory included large areas of agriculture but a sparse population. Hence the Class C duties were typically of the mixed-traffic variety. As well as the passenger traffic for which they were designed, they were also used on fast perishable produce trains and fish trains. After the rebuilds, the ten D54s were usually reserved for the express passenger services due to their larger grate area. The D52s and D53s were used for most other duties, and often combined fast passenger and fast freight in opposite directions of the same round trip. Passenger duties were typically the through trains from the Midlands to Yarmouth and Lowestoft; and the Peterborough to Cromer expresses. The Peterborough to Cromer expresses were a part of the GNR's competition with the Great Eastern Railway (GER). These two railways became a part of the LNER with Grouping (1923), and these services dropped in importance. This contrasted with the through traffic from the Midlands. The summer Saturday seaside traffic from the Midlands grew significantly, and was an important revenue earner for the M&GN during the 1930s. Double heading of these heavy trains was common, although single-handed D52s and D53s were often recorded hauling twelve or even fifteen bogie trains. Coal consumption was heavy, but the D52s and D53s managed to handle these extremely heavy loads with success. The inevitable signal delays due to so much traffic running on a single track line helped, as the delays allowed them to 'catch their breath' as it were, and build up sufficient boiler pressure. When it took control in 1936, the LNER found that many of the M&GN's locomotives were worn out. Thirteen D52s, one D53, and three D54s were quickly withdrawn in a space of twelve months. Withdrawals of the D52s continued steadily until 1943 when the last was withdrawn. Five of the D54s survived until 1943, when all were withdrawn within a space of eight months. The D53s survived longer with their relatively new boilers. Withdrawal of the six remaining engines started in 1941, and was completed in January 1945. Cylinders (x2): (inside) 18.5x26in. 18.5x26in. 18.5x26in. Heating Surface: Total: 1078 sq.ft. 1078 sq.ft. 1384 sq.ft. Firebox: 110 sq.ft. 110 sq.ft. 127 sq.ft. Grate Area: 17.5 sq.ft. 17.5 sq.ft. 21.0 sq.ft. The last of the S.W. Johnson Class C 4-4-0s was withdrawn in 1945. None survived into preservation. I am not aware of any models of the D52, D53, or D54s in any scale. Thank you to David Hey for the photograph of D52 No. 042.